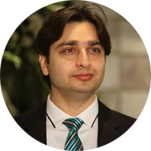 Faisal Qureshi is a highly enthusiastic and active member of Amer Adnan Associates®. He has been working as a Marketing Manager for the firm since 2012. Faisal’s responsibilities include managing and overseeing digital marketing team, business branding, media relations, advertising and finding new business opportunities. He also administers promotional activites, sponsorships, events, and marketing training for Amer Adnan Associates®.